NEW YORK (WABC) -- The FDNY announced Monday that 2016 had the lowest number of fire deaths ever recorded in a year since 1916. "Never has our city been as safe from the ravages of fire as we are today, thanks to the heroic work of our firefighters and all FDNY personnel," said Mayor de Blasio. "This record-breaking, historic achievement is the result of true teamwork by our fire and EMS first responders, fire marshals and dispatchers, as well as inspectors and fire safety educators who helped reduce serious fires by 9 percent this year. Together, these hard working FDNY members have made a tremendous impact on our city and ushered in a new era for fire safety for all New Yorkers." 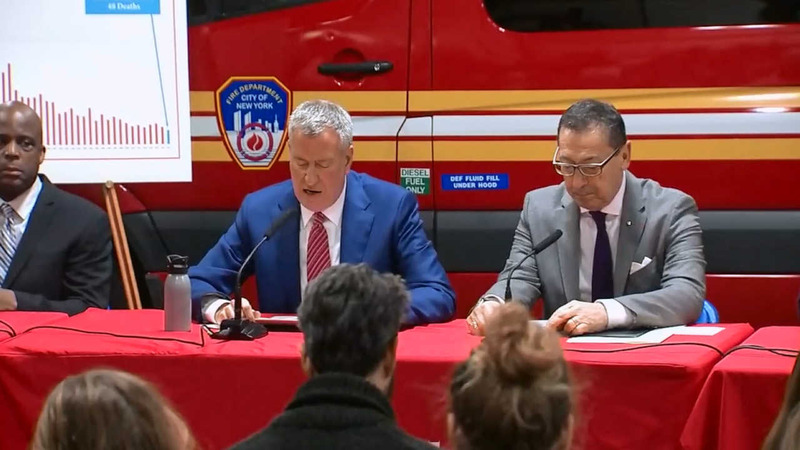 48 people died in fires last year, according to Mayor Bill de Blasio and Commissioner Daniel Nigro said. In addition, the city also saw a nine percent decline in serious fires.